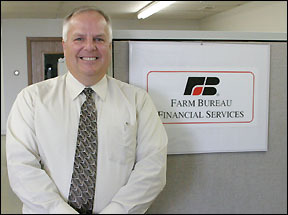 Bruce Vanderpool of Paynesville recently started a new career, as an agent for Farm Bureau Financial Services. His office, located downtown on Washburne Avenue, opened at the beginning of March. Curiosity about the financial services industry led Bruce Vanderpool of Paynesville to a new career, as an agent for Farm Bureau Financial Services. His office, located downtown on Washburne Avenue, opened at the beginning of March. Vanderpool said he looks forward to helping people protect their family and their assets now and in the future. As an agent with Farm Bureau, he is licensed to assist people with their insurance needs for home, auto, life, and annuities. Bruce Vanderpool opened a new office for Farm Bureau Financial Services on Washburne Avenue in downtown Paynesville in March. Vanderpool was born and raised in the Paynesville area, graduating from Paynesville High School in 1975. He owned and operated Paynesville Hardware in downtown Paynesville until 1993. After eight years as the sales and operations manager at Koronis Parts, he started the accessory department at Tenvoorde Ford in St. Cloud. He managed that department for five years but wanted to be working in Paynesville again. Three years ago, he started comparing companies to find the right one for him, and he has since gone through intensive company training and met industry requirements to become a licensed agent. One of the best parts of his new position is not having a commute, he said, especially as his son Bradley attends Paynesville Area Elementary School. He and his wife Susan have one other son, Jason, who graduated from PAHS in 2002.